If you attended last year’s Park Palooza, you know what a success it was. We’re happy to announce the imminent arrival of this year’s Park Palooza event, which will surely be every bit as amazing (and maybe even more amazing) as last year. Many of the staff here at Elmhurst Toyota have marked Saturday, August 19 on our calendars. After all, where else can you go to listen to great music, eat delicious food and just have a great time with the family? Second Time Around will play from 5:30-7:30 p.m. These guys are really great. They’re one of the best classic rock cover bands in Chicagoland. Whether you like Fleetwood Mac, Yes, the Rolling Stones or Lynyrd Skynyrd, this band has something for you in its repertoire. No Alternative will take the stage from 8:00-10:15 p.m. This band plays everything from the latest hits to classic rock. Make sure to wear your dancin’ shoes, because No Alternative will have you dancing under the stars. While the adults will find plenty to do, Park Palooza also features many events for the kids, including face painting and arts and crafts. There will be a variety of food trucks serving meals that everyone in the family will enjoy, including kid-tested favorites like grilled cheese sandwiches, pizza and cupcakes. Adults will enjoy the beer and wine garden. All the facilities at Berens Park will be open during Park Palooza, which means you can take advantage of miniature golf and the batting cages. So, make sure you get to Park Palooza this year. Grab some lawn chairs, round up the family and head over for some summer fun before the summer’s over. It’s sure to be a great time. 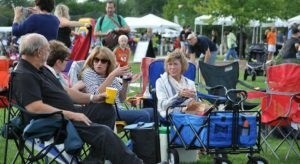 August 19, from 5-10 p.m.
Visit http://www.epd.org or call the Elmhurst Park District at 630-993-8900.